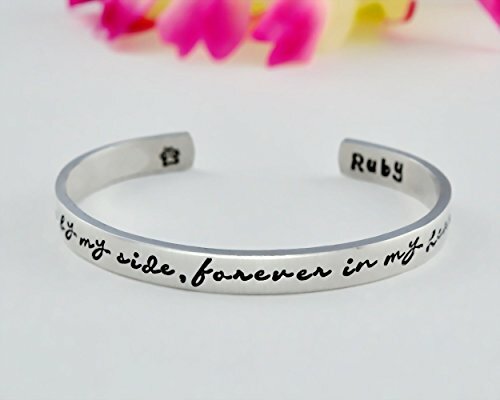 This listing is for one hand stamped cuff bracelet, stamped with "once by my side, forever in my heart", a dog paw print stamped on the inside. A pet name can be stamped on the inside if needed, please enter it at checkout. Keep your pet closed to your heart! This cute bracelet is specially made for yourself, or a gift to your pet's owner friends. The bracelets are made of 1100 pure aluminum ( food grade, hypoallergenic, non tarnish), which has a much lower rate of skin reaction than sterling silver. This bracelet can also be made in copper or brass. Each bracelet is made of 1/4" (6 mm) wide x 6" long aluminum strip which fits most averaged medium sized wrists. If you have any questions about this product by Stamped Love, contact us by completing and submitting the form below. If you are looking for a specif part number, please include it with your message.